A detailed guide to the best golfing in Asia with tips for golf courses and resorts, from Thailand to Bali, by Libby Peacock, and more from Smart Travel Asia and Dancing Wolf Media. How to swing out at the best golf courses in Asia. You’ll find the caddies eager even if the oxygen is sometimes meagre. But what about landmines? Golfing from Kabul to Vietnam. GOLF fever shows no signs of abating in Asia, where the latest set of clubs remain a definite status symbol. Swing your Callaway five-iron-loft hybrid to send a well directed shot at check-in staff at the end of that tumultuous airport queue to alert them of your arrival. Or opt for a TaylorMade fairway wood. The good news for enthusiasts of the sport is that the region’s top courses are not only for the Tigers and Ernies of this world – there are plenty of scenic greens on which to practice your putt in resort surrounds where preening royalty would not be out of place. Here’s our roundup of the most interesting golf courses in Asia. But it’s not all boring greens. If you have the moxie, head to Afghanistan to check out the devilish “browns” at the country’s only golf course - Kabul Golf Club (www.kabulgolfclub.com is an on and off site or try the informal www.kabulgolfclub.org), a high-altitude high-risk desert course where the hazards go beyond the usual roughs and bunkers. Taliban spoilsports have taken their toll – sometimes with bloody results – but the course plods on, whittled down, yet ever valiant. The greens are “browns”, carefully compacted oil and sand that have seen their share of live combat - and landmines - through the years. Road construction in recent years has chopped the former 9-hole course to a 5-hole course which tees off from a wooded or artificial-turf mat high up the valley where the views and the lack of oxygen may leave you breathless. Watch for sand and rocks and more sand. Your ball soars through the rarefied air, whizzing a reported 10 percent farther than at sea level, all for the same effort. Enjoy the luxury of a bag caddie as well as a “fore” caddie who runs ahead to spot errant balls – most of them are young 10-year-olds with an incredible passion for the sport. But this is one place where you won’t await the luxury of golf carts or a round of cold drinks served on the green. Kabul Golf Club: play the "browns"
Kabul is a desert course – much the new trend in the Middle East – but yes there is one water hazard, at times. The course is open from 7am till dusk and is just 10km from the Kabul InterContinental (tel: [93-20] 256-2765, www.intercontinentalkabul.com), your closest digs. Green fees at the Kabul Golf Club are around US$15. The course has gone through a number of ups and downs during recent years so do get in touch with the club to make sure it can accommodate you safely before showing up with your gear. Extending a royal invitation to the country that boasts over 250 golf courses, and doing some of the legwork for you is “Golf in a Kingdom: The Thai Golf Experience” (www.golfinakingdom.com), an itinerary that matches some of the country’s top courses with a few of its best hotels. Golf in a Kingdom covers Thailand’s six distinct geographical regions – from 8,000ft mountains in the north to limestone islands rising out of the Andaman Sea in the south, so choose your golfing poison, sea, sand, or sky high and get swinging. Thailand is almost as famed for its golf courses as it is its beaches, and you can’t go wrong in Phuket for a good combination of both. 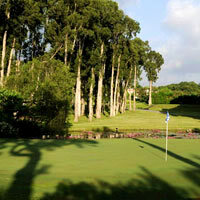 Laguna Phuket Golf Club (tel: [66-76] 324-350, www.lagunaphuketgolf.com) is one of Thailand’s top golf resorts completely overhauled with a fresh coating of verdure early 2015. Visitors have a choice of six Laguna Phuket hotels to stay at: Banyan Tree Phuket, Dusit Thani Laguna Phuket, Laguna Holiday Club Phuket, Angsana Laguna Phuket, Allamanda Laguna Phuket and Outrigger Laguna Phuket Resort and Villas. The course has undergone a complete upgrade with the full 18-hole, par-71 reopened and operational by 1 January, 2015. 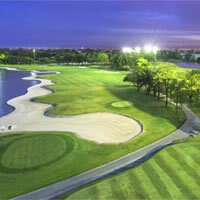 The course, designed by Max Wexler and David Abell, features gently undulating fairways with lagoons and large greens. There’s also an indoor teaching centre that opened mid-2004. Green fees are from Bt3,060 for resort guests. Possibly the most famous golf club in Phuket, the championship Blue Canyon Country Club (tel: [66-76] 328-088, www.bluecanyonclub.com/golf/ or www.phuketgolfcourse.com), has its own 32-room boutique hotel with an en-suite Jacuzzi bathrooms, and the Golfers Spa Lodge, but is also served by several five-star resorts within striking radius. Among these is the Trisara (trisara.com), which holds membership at Blue Canyon and offers the complimentary use of high-quality golf clubs to guests. Blue Canyon, surrounded by mountains and sea in northern Phuket, has two 18-hole par-72 award-winning championship courses: the 7,179-yard Canyon Course and the 7,129-yard Lakes Course. Green fees and caddy charges for 18 holes at the premier Canyon Course are roughly Bt5,600. These are perhaps the best Phuket golf courses for your weekend diary. To complete your Phuket golfing spree, try the 27-hole Phuket Country Club (tel: [66-76] 319-200/1/2/3/4, www.phuketcountryclub.com), which includes the 18-hole 'Old Course', and a 9-hole 'Championship' course. There are also 52 driving bays at this place so swing out big time. The caddie for an 18-hole game is Bt400. 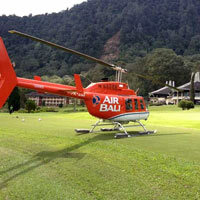 The Phuket Country Club is near Kathu Falls mid-island not far from Patong. Also in the central Phuket island Kathu District are the Loch Palm Golf Club (tel: [66-76] 321-930, www.mbkgolf.com/lochpalm) and the Red Mountain Golf Club (www.mbkgolf.com/redmountain), both run by MBK Golf. Riverdale is another course managed by the MBK group so there's no dearth of putting and swinging opportunities here. This is former tin mining country and the golf - despite its water guzzling - has transformed the area into a scenic escape. Located in the secluded and still eminently green northeast of the island, the Mission Hills Golf Resort & Spa (tel: [66-76] 310-888, www.missionhillsphuket.com) is just ten to 15 minutes from the airport. It should not be confused with the mammoth Mission Hills Golf Club in Shenzhen, southern China, featured later in this report. Bangkok has a number of notable golf courses, but if you’re looking for a golf resort, Le Meridien Suvarnabhumi Golf Resort and Spa (tel: [66-2] 118-7777, www.lemeridiensuvarnabhumi.com) may be it. Located between the airport and the city centre, the place boasts an 18-hole Nick Faldo course, and 223-rooms overlooking the greens. The Ronald Garl-designed championship Alpine Golf and Sports Club (tel: [66-2] 577-3333, www.alpinegolfclub.com) is a relatively rural option. The beautiful undulating course was originally created from flat rice paddy fields. It was venue for the 2000 and 2004 Johnnie Walker Classic PGA tournament, and is about an 80-minute drive from the city. 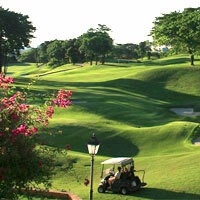 It has also hosted some Johnnie Walker Classics, and it is regarded as one of Thailand’s more challenging courses. With the electric carts and decent clubhouse at modern The Black Mountain Golf Club (www.bmghuahin.com) you don’t even have to pick up a golf club to have a good time. But if you’re here to swing the well-linked course is a bonus. This is luxury golfing with well-appointing villas and condominiums for endless days and nights course-side. At Banyan Thailand Hua Hin (www.banyanthailand.com/) you'll find a golf club, a smart villa resort and meetings and conference facilities. Golfing in Thailand doesn’t stop here. On the north coast of the idyllic island of Koh Samui, is the international-standard, 6,932-yard, 18-hole, par-72 Santiburi Samui Country Club course (tel: [66-77] 421-700, www.santiburi.com), with green fees from around Bt4,000. 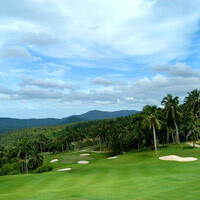 Opened in 2003, the course (nicknamed “the beast of Samui”) is set on a mountain slope between 30m and 190m above sea level, and therefore boasts more than decent views and cool breezes. The 6th, par-3 hole features a vertical drop and a waterfall. The green fee is Bt3,000 for hotel guests and Bt4,000 for visitors plus the mandatory Bt740 for a golf cart and Bt300 for a caddy. Stay at the luxurious Santiburi Resort, or at the contemporary Thai-style Bo Phut Resort and Spa (also managed by the Santiburi Group), with a regular complimentary shuttle service between the hotels and the course. Pattaya can be a bit rough around the edges, but a short 30-minute drive from the seaside town is the Laem Chabang International Country Club (tel: [66-38] 372-273, www.laemchabanggolf.com), a par-72, Jack Nicklaus-designed course. Featuring an intimate 40-rooms, The Golf Lodge is linked to the clubhouse by a bridge. 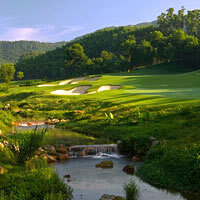 There are two courses, the 3,446-yard Mountain 9 and the 3,419 Valley 9, with a stream running through it. The charge for visitors is from Bt3,000 (weekdays). Lodge guests and members’ guests pay less. There’s a golf academy programme that caters to a range of abilities, from beginners to advanced. Chiangmai Highlands Golf and Spa Resort (tel: [66-53] 261-354, www.chiangmaihighlands.com) offers an 18-hole course with paspalum fairways and Tiff eagle greens, which translate into greener fairways and faster more consistent plays. Bunkers are deep and severe on errant shots. Mown grass areas surrounding the approach to the greens provide the option of playing either a chip-and-run, pitch shot or even putting the ball up onto the green. 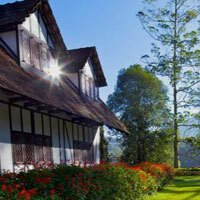 The resort at Chiangmai Highlands offers villas and rooms. Each villa has its own private outside shower, spoiling bathroom, minibar and a bed set on wooden deck, Thai style. If you’re really keen you can buy a house here, from 222sq m to a two-storey 382sq m Lanna-style home. For an inland Thai location, the Santiburi group offers the Santiburi Country Club Chiang Rai (tel: [66-53] 662-821, www.santiburi.com). 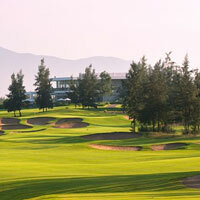 This is an 18-hole, 6,853-yard Robert Trent Jones Jr-designed course, 10km from the Chiang Rai city centre. 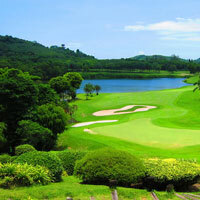 Landscaping, lakes and streams are the order of the day on this north Thailand championship site, and it’s suitable for players of all capabilities. Another Chiang Rai option is the championship course at the Waterford Valley Chiangrai (tel: [66-53] 395-3440, www.waterfordvalleygolfcourse.com) with green fees from Bt750, weekdays. There’s a comfortable golf lodge that caters both for families and business travellers, and features horse riding, a swimming pool and tennis grounds on site. Also in Chiang Rai is the Korean built Happy City Golf Resort (tel: [66-53] 602-637, www.happycitygolfresort.com), a 29-hole PGA-designed golf course built in 2012 – and has the added bonus of a full sports complex. And that’s some of the best of golfing in Thailand where the greens keep sprouting, aided by growing numbers of golf fans and favourable weather for lush courses. Golfing in Bintan is so popular with Singaporean day-trippers and weekenders you’d be forgiven for thinking it was perhaps just off Orchard Road. In fact Bintan is part of Indonesia. Here the Ria Bintan Golf Club (tel: [62-770] 692-839, www.riabintan.com) has a popular 27-hole championship golf course designed by veteran Gary Player, consisting of an 18-hole Ocean Course and a 9-hole Forest Course. An Asian-based golf magazine has named the Ocean Course’s hole 7 the “best par-5 hole in Asia”. The golf club is part of the Bintan resorts destination (just 45 minutes by ferry from Singapore), and has its own 31-room Golf Lodge - there’s also a choice of additional accommodation options, including the beachfront Club Med Ria Bintan (tel: 1-800 258-2633, Singapore toll-free, www.clubmed.com.sg). The luxurious all-villa Banyan Tree Bintan (tel: [62-770] 693-100, www.banyantree.com/en/ap-indonesia-bintan) has its own 18-hole Greg Norman-designed Laguna Bintan Golf course with signature holes 7 and 8, framed by the South China Sea, and the additional benefit of a luxury spa for some soothing relief post golf. A huge upgrade to all 18 holes was completed on 1 July 2016 marking a major facelift for the area and providing a big bonus for guests at neighbouring hotels. But wait... there’s more. The Bintan Lagoon Resort (tel: [62-770] 691-388, www.mozaichotels.com/#/en/hotels/bintan) has its own two acclaimed championship courses. The first, a Seaview Course designed by Jack Nicklaus has a distinctive par-3 hole 12 played against a backdrop of the South China Sea, and Ian Baker-Finch’s Woodlands Course runs over undulating natural landscape. Golf gear and clubs can be rented here, and golfing fees (including green fees and buggy) are from S$120 on weekdays, for nine holes. 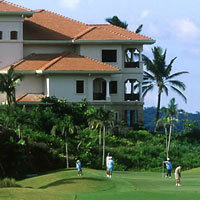 The resort also offers year-round coaching and golf classes. To swing out in paradise, there’s always the “Island of the Gods”, Bali. Nusa Dua’s upgraded and late 2014 reopened Bali National Golf Club (tel: [62-361] 771-791, www.balinationalgolf.com) offers a scenic 18-hole course designed by Nelson, Haworth Golf Course Architects, with the 17th hole playing out to the Indian Ocean and a posh clubhouse overlooking the 18th. Hole 9 has you driving over a ‘babbling brook’ while Hole 1 offers a flex for big hitters. If you’re in the mood to buy, villas are on the horizon. 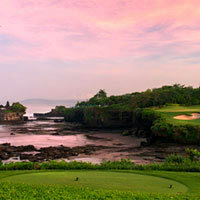 More details on Indonesia golf courses and Bali greens on specialist site IndoGolf (www.indogolf.com). On the southwest of the island is the New Kuta Golf (tel: [62-361] 848-1333, www.newkutagolf.com) adding to your swinging pleasure in the shopping and entertainment haven of Kuta. This is an unpredictable links-style course with shifting wind conditions and breezy sea views all around. According to launch general manager Rajakulasingham, "Hole 15 Par 3 set on top of brilliant white limestone cliffs, over looking the endless blue horizon of the Indian Ocean, can play anything from an 8 iron to a wood with the howling wind coming at you." Sounds fun. Expect a pro shop, practice range, an academy and a spa to work off apres-greens stress. This is a par 72 championship 18-hole golf course set in 85 verdant acres. In Sanur, there is the Bali Beach Golf Course (tel: [62-361] 287-733, www.balibeachgolfcourse.com) with Bali’s only night-driving range and nine holes all located within the grounds of the Inna Grand Bali Beach Hotel. The attractive Nirwana Bali Golf Club (tel: [62-361] 815-960; www.panpacific.com/en/hotels-resorts/indonesia) adjacent to the sprawling Pan Pacific Nirwana Bali Resort is set among the dramatic rice paddy fields on Bali’s west coast, with the 7th hole’s scenic overlook of the must-see Tanah Lot temple. 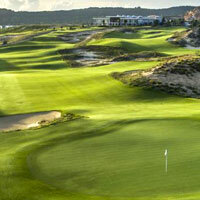 Opened in 1997, it is another multiple award-winning Greg Norman-designed course. Think verdant rice terraces, lush foliage and Indian Ocean views with awesome sunsets. Green fees are from US$175 (including green, cart and caddie fees). The par-3 hole 7 (played from a cliffside tee to the fairway across a piece of the Indian Ocean) is a dramatic signature hole. Hole 13, played along the cliff tops, requires a fair amount of concentration. The course is just up the coast from swinging Seminyak. About two hours’ drive from Bali’s Nusa Dua resort area, the Bali Handara Country Club (tel: [62-362] 3422-646, www.balihandaracountryclub.com) is a cooling option at 1,142m above sea level. Found within a mountain resort with room and bungalow accommodation, this public golf course is set inside a volcanic crater beautified by tall trees and flowers. Green fees are from US$150 for guests staying at the resort, which also has facilities for small meetings and conferences. Upgrades continue. Leaving the island and jumping to another Indonesian island – East Java – there’s a course from the same designers but with a totally different flavour (albeit very Indonesian). 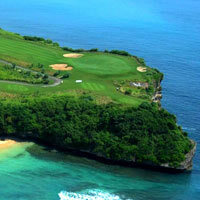 This is the Finna Golf and Country Club Resort (tel: [62-343] 634-888; www.finnagolf.com), a 45-minute drive from Surabaya. The designers closely stuck to a brief requesting that the resort and all its facilities blend into the environment with minimal disruption to the surrounding nature, and the par-3 hole 5 has views of the countryside as well as the famously volcanic Mount Penanggungan. The resort has 32 private luxury cottages – and two VIP cottages each with a private swimming pool. Malaysia golfing is flush with quite a few top resorts, of which the Mines Resort & Golf Club (tel: [60-3] 8943-2288, www.minesgolfclub.com/web/) near Kuala Lumpur is a prime example. It is part of the Mines Resort City with its giant, extravagant Palace of the Golden Horses, and the course – designed by Robert Trent Jones – is situated on what was once the largest opencast tin mine in the world. Its distinguishing feature is a huge lake, created to fill in part of the mine. Among the clubhouse facilities are a high-tech boardroom, an open-air restaurant, a spa, VIP waiting room and two presidential suites. The Saujana Golf & Country Club (tel: [60-3] 7846-1466, www.saujana.com.my) in Selangor near Kuala Lumpur has hosted nine Malaysian Opens. 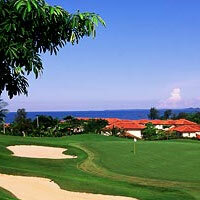 It boasts two famous international courses – the Palm Course and the Bunga Raya Course – both designed by Ronald Fream. Green fees are from Rm350 for 18 holes on weekdays, and caddies and buggies are extra. Players can then snooze in style at the five-star The Saujana Kuala Lumpur (www.thesaujana-kualalumpur.com/ppc/), with extensive conference facilities and sprawling gardens. Nearby is the acclaimed The Royal Selangor Golf Club (tel: [60-3] 9206-3333, www.rsgc.com.my), with 36 holes that comprise an 18-hole Old Course, an 18-hole New Course and a 9-hole Suleiman Course. The institution was established in 1893 and is the haunt of many a cabinet minister and other high-flyers. Its signature hole is the Old Course’s 17th hole, which, according to the club, has “significant elevation changes and an elevated green, guarded by bunkers”. The course has been reconstructed. 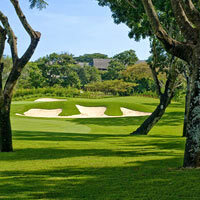 Weekday green fees for hotel guests are from Rm450 for 18 holes, and from Rm250 for members’ guests. Colonial comforts and undulating tea-strewn hills are very much the flavour at Cameron Highlands, a cool getaway 200km north of Kuala Lumpur. Like many hill stations, this was developed as a summer escape for sweaty Europeans – and Britain’s more pleasant influences live on in scattered rose gardens and mock-Tudor architecture. Tee off with tea garden views at the 18-hole, par-71 Cameron Highlands Golf Course (tel: [60-5] 491-1126) in Brinchang. This is a public course and is considered relatively challenging, with thick rough, a number of streams and fine sand bunkers. Early play is advised to avoid the afternoon rains. Green fees are RM95.40 on weekdays and RM152.65 on weekends and public holidays, with a caddy fee of RM30. Although the elegant, upscale Cameron Highlands Resort (tel: [60-5) 491-1100, www.cameronhighlandsresort.com) is part of the property, with 56-elegant colonial-style rooms and suites, another pleasant colonial-stay option nearby is the boutique property The Lakehouse Hotel (tel: [60-5] 495-6152, www.lakehouse-cameron.com) with 18 rooms, and lashings of charm. For a special game of golf, head for the mellow and laid back Malaysian island of Langkawi, where The Els Club Teluk Datai (tel: [60-4] 9500-500, www.thedatai.com/langkawi/golf) is set in a tropical rainforest with all the flora and fauna to match. It’s not unusual to spot a monitor lizard ambling across the fairway. The golf course is attached to the splendid and atmospheric five-star property, The Datai Langkawi (www.thedatai.com/langkawi/). The last hole is played out of the forest onto the Andaman coast. This is a true Jurassic Park setting so watch for swooping pterodactyls as you perfect your drive. More island golf is available in multi-attraction Penang where the large business-friendly Hotel Equatorial Penang (tel: [60-4] 643-8111) near the airport is conveniently neighboured by the18-hole Penang Golf Club (formerly known as the Bukit Jambul Country Club, tel:  644-2255, www.penanggolfclub.com.my) which underwent a facelift and reopened in 2012. The hilltop course has views of Penang and the Penang Bridge linking it to mainland Malaysia. This is another Robert Trent Jones course, with a famous 10th hole – the tee is located 100ft above the fairway. And that in a nutshell sums up golf in Malaysia though courses abound in the east coast of peninsular Malaysia around Kuantan (the 18-hole 55-hectare Royal Pahang Golf Club, royalpahanggc.com.my) close by the Hyatt Regency, well known family holiday spot Cherating (Club Med), and farther afield in Sabah and Sarawak. 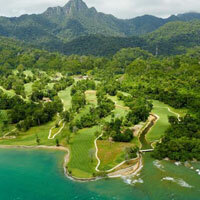 In Sabah (Borneo) try the 1976 vintage Sabah Golf & Country Club (sgccsabah.com) with its charming 18-hole course. Walk-in green fees weekdays are RM180 going up to RM320 weekends inclusive of green fees, buggy and mineral water. The small, “dry” sultanate of Brunei may not be a party animal’s paradise, but when it comes to golf and glamour you can’t go wrong. The Empire Golf Club attached to the large and glitzy The Empire Hotel & Country Club (tel:  241-8888, www.empire.com.bn, green fees from B$170, weekdays) is a golfers’ dream. The par-71 Jack Nicklaus-designed championship course has fabulous sea views with cliffs and ravines thrown in. All 18 holes are floodlit so you’ve got your evenings cut out for you. The signature hole is the 15th, which takes players right along the beach. Vietnam is still an up-and-coming golf destination. But brands are racing to set up shop here as business and interest picks up. The new 18-hole Greg Norman club at Long Beach, Cam Ranh — KN Golf Links Cam Ranh (tel: [84-258] 656-6988, www.kngolflinks.com/) — not far from sun-and-sand dive resort Nha Trang was up and running by late 2018. In addition to the 18 holes at The Links, expect nine parkland-style holes for big swingers who enjoy variety and challenge. Weekday fees for nine holes is VND2,025,000 and VND3,375,000 for 18. The Nick Faldo-designed Ocean Dunes Golf Club that opened in 1996 has since closed but others are filling the golfing void. The course winding over beach dunes was perfect for those who wanted to roll out of bed and right onto the golf course. The Dalat Palace Golf Club (tel: [84-63] 3823-507, www.golfdalat.com) has been around since 1922, but was redesigned in 1994. There are plenty of lakes and large greens to suit the lush, lake-dotted alpine city, established by the French way back when as a ‘Petit Paris’. Each hole has four different tee areas, letting players choose their own degree of challenge. An 18-hole morning will set you back just 1,590,000 dong. Guests have the option of staying at the nearby Dalat Palace Luxury Hotel & Golf Club or the Du Parc Hotel Dalat. In Hoi An along fabled China Beach, sample The Nam Hai’s (www.fourseasons.com/hoian/) exquisite beachfront villas with impeccable service whilst enjoying teeing off at the scenic 18-hole Montgomerie Links (www.montgomerielinks.com), 15 minutes from Danang Airport, or the Danang Golf Course. The Greg Norman Dunes Course (www.dananggolfclub.com) is a Danang favourite with breezy sea views and exhilarating stretches. And just up the coast is the lush Laguna Lang Co Golf Club close to the Banyan Tree Lang Co (www.lagunalangco.com/hotels/banyan-tree) and the Angsana. Both are fine family or luxe getaways with top quality spa services to boot for an après-golf massage and rubdown. Not surprisingly, golf is booming in China and the country already has a number of world-class championship courses, of which the gargantuan Mission Hills Golf Club, spanning Shenzhen and Dongguan (tel: [86-755] 2802-0888, www.missionhillschina.com) very near the border with Hong Kong), is arguably the most famous. Accredited by Guinness World Records as the globe’s biggest (with 25sq km currently in use), the 80,000sq m club is part of a sprawling family resort also offering leisure, entertainment, spas, meeting and conference facilities and restaurants. If you truly can’t get enough of golf, this is the place for you: there are no less than a dozen 18-hole courses designed by legends such as Nick Faldo, Ernie Els and Vijay Singh, to name just a few. Stay at the five-star Mission Hills Resort & Spa and improve your game at the Mission Hills David Leadbetter Golf Academy on-site. Also in Shenzhen, the Shenzhen Xili Golf and Country Club (tel: [86-755] 2655-2888, www.xiligolf.com), managed by Shangri-La, has a popular 36-hole course, designed by Lynx architects Nelson, Wright, and Haworth, is set in the scenic Nam Sham area of Shenzhen. The highly ranked Spring City Golf & Lake Resort (tel: [86-871] 6767-1188, www.springcityresort.com) is located about 40 minutes from Kunming in China’s Yunnan province, at 2,100m above sea level. It sports two courses built in 1998: a Lake Course known for being challenging (there’s a drop of 150m from the clubhouse to the 8th green), and a Mountain Course. As the names suggest, lake and mountain views abound. The club is part of an integrated resort. Stay in one of the lodges, with different room types and suites offering all the mod cons. Another famous Chinese championship course, this time shaped like a dragon’s claw, is the par-72 Yalong Bay Golf Club (tel: [86-898] 8856-5888, www.yalongbaygolfclub.com) on China’s resort island of Hainan. Players have to negotiate lakes, marshes and coconut palms and no one with a handicap of over 40 is allowed to play here. There’s night golf, too. This is another of the many Robert Trent Jones Jr courses in Asia, located at the Yalong Bay Golf Resort, 25 km from Sanya city with several top-drawer addresses from Mandarin Oriental to Ritz-Carlton and St Regis to pick from for your holiday stay. Farther up the east coast is Haitang Bay, which is developing fast. Stay at the sprawling Kempinski Hotel Haitang Bay Sanya (www.kempinski.com/en/sanya/), which offers its very own 18-hole golf putting greens or head farther afield to swing out at the 27-hole Sun Valley Golf Club or the Nelson and Haworth Mystic Springs Golf Club (www.mysticsprings.com.cn) on its two 18-hole courses. 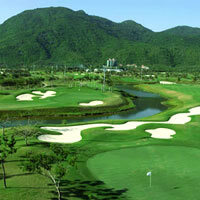 If in town for a conference or en route to Sanya, in Hainan Island also check out Mission Hills Resort Haikou (www.missionhillschina.com/en-US/haikou) for top class stays and high-power golf where three excellent courses await – Blackstone, Sandbelt Trails and The Vintage Course. Blackstone is a 7,808-yard par-73 course while the Vintage course runs 7,363 yards at par 72. The Australian-inspired Sandbelt Trails course features eucalyptus trees and wide fairways. Contrary to popular belief, Hong Kong offers a lot more than city attractions and highrises. There’s plenty of green space and a number of quality golf courses, though none attached to resort hotels. A famous spot to tee off is The Hong Kong Golf Club, Fan Ling (tel:  2670-1211, www.hkgolfclub.org) – an institution that has been around since 1911, and also runs a course in Deep Water Bay. 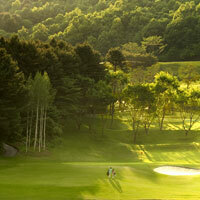 Green fees from HK2,000 and visitors are welcomed from Mondays to Fridays. There are 40 twin rooms available. The non-profit Jockey Club Kau Sai Chau (tel:  2791-3388, www.kscgolf.org.hk), which like the Fan Ling course is located in the New Territories, is Hongkong’s only public golf club, with no membership required. There are two Gary Player-designed 18-hole courses, a North Course and a South Course, but non-Hongkongers can play there only on weekdays. This is a scenic spot with picturesque sea and mountain views. The course is accessed by ferry from Sai Kung and is arrayed across a secluded island. Nearby Macau is booming, and golf is one of its attractions. The par-71, 18-hole championship course at the Macau Golf & Country Club (tel:  2887-1188, www.mgccmacau.com) is attached to the five-star, family-friendly Grand Coloane Resort (formerly the Westin Resort, Macau). The hillside course is designed by Japanese course architect Hiroshi Ikeda, and has views over the Pearl River estuary and a nearby beach. It hosts the Macau Open, which is part of the Asian PGA Tour. This is a child-friendly getaway with facilities for kids to keep them entertained while the adults tee off. The Philippines is home to a number of world-class courses, including the well-known Manila Southwoods Golf & Country Club (tel: [63-46] 430 0260, www.manilasouthwoods.com) in Cavite, about 34km south of Manila. The club has hosted many top tournaments and features two par-72 Jack Nicklaus courses: the Masters – with water hazards surrounding 15 of its holes – and the Legends. In Laguna province, about 40 minutes’ drive from Makati, the Santa Elena Golf Club (staelenagolf.com) is a 27-hole course over 120 hectares of gentle terrain. If you want to play here though, you have to be accompanied or sponsored by a member. A short hop by twin-prop plane is the sun, sand, and golf paradise of Boracay with a fine all-weather option. Of course in the rainy season you may have to pack your clubs for a while till the winds abate. Check out the 18-hole par 72 Fairways & Bluewater Newcoast Resort (www.fairwaysandbluewater.com.php) and opt for lodgings from cheep and cheerful to costly and cosseting around the island, like the splendid Shangri-La Boracay Resort & Spa. Japan is famously exorbitant when it comes to golf (and many other things), but as a country of golf fanatics there are more than 2,000 courses in the country. It can be tricky to get a game at Japan’s best members-only courses though, among them Hirono (which has hosted all the major Japanese championships), Tokyo Golf Club (you need an invite to play there) and Naruo (which, according to one golf site, has 700 members with an average age of 71). However, there are some options for visitors passing through Japan, such as the Phoenix Country Club (tel: [81-985] 39-1301, www.seagaia.co.jp) set within the Phoenix Seagaia Resort on the coast in Miyazaki. The club with its resort-like atmosphere gained fame for hosting the Japan PGA’s Dunlop Phoenix Tournament, and the 27-hole course, lined by pine groves, is known to be a challenging one. At the centre of the resort is the five-star Sheraton Grande Ocean Resort (www.seagaia.co.jp) with Pacific Ocean views from all 743 rooms. Sold as “Tokyo’s premier international golf destination”, the Windsor Park Golf and Country Club (tel: [81-296] 88-2221, www.wpgcc.com) also has conference and meetings facilities. The Windsor Park Hotel takes a maximum of 29 guests at a time but has sweeping golf course views. The 18-hole course is geared towards golfers of all levels, and there’s a driving range and practice putting green. Sunday rates are highest, at about Y14,000, but they can be less than half that during the week – rates change both weekly and monthly, so check the play fee calendar for your best options. Parents can relax though: there’s a dedicated children’s centre to look after tots while the grownups golf. The Ananti Club Seoul (Tel: [82-31] 589-3000, www.ananticlub.com) is a spacious and intriguingly modern 27-hole golf course in the Yumyeongsan forest a 30-minute drive from the city. This is a generous 486-acre spread with plenty of luxuriant green underfoot interspersed with some stunning and sleek, minimalist space-age architecture. The golf course and club includes 12 lakes, a library, tennis courts, outdoor swimming pool, children's pool, clubhouse and a stylish restaurant and cafe. The venue can also be used for small corporate meetings with a banquet hall that can hold up to 80 persons. Golfing in India is no problem at all. Most Indian metros will have a reasonable golf course or two. 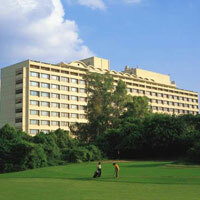 New Delhi boasts the charming Delhi Golf Club, the oldest in the capital and smack in the centre of town. The greens are lined by over 200 species of trees and wild birds flock here in winter for sanctuary from harsh Russian winters. Designed by Peter Thompson the par-72 course is 6,869 yards. The club offers a swimming pool, pro shop, restaurant and bar. But you’ll have to grab a member to go play if you’re just passing through town. The neighbouring and superbly run The Oberoi New Delhi (tel: 91-11 2436-3030, www.oberoihotels.com) is a splendid place to park. The Classic Golf Resort (www.cgronline.com) in Gurgaon (just across the Delhi border to the south) is a Jack Nicklaus inspired course set in extensive greens just a 50-minute drive from the capital. Swing out at the 9-hole Canyon Course or flash your clubs at the main 18-hole Championship Course. The club also has reciprocal membership with the Royal Selangor in Kuala Lumpur. Also close to Delhi, established in 1989, is the Noida Golf Course (www.noidagolfcourse.com) with full club facilities, pool and extensive recreation options. For something a tad different, higher and cooler head to the Ooty Golf Club set at an elevation of over 6,000ft with 18 holes racking up 6,074 yards with a par-70. To make things more challenging, half the holes are “blind” which means you’ve no idea where the hole is, well… At the 13th green pause to savour the sights and smells, perhaps even of the Ootacamund fox hunt (that dates back to the mid 1800s). Higher still, heading north into Kashmir, is the Gulmarg Golf Club (gulmarggolfclub.golfgaga.com), a par-72, 18-hole, lengthy 7,505 yards where your lungs will strain to take in oxygen. 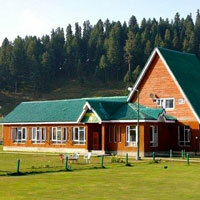 Created by the Raj as a flavoursome summer retreat, the Gulmarg Golf Club was redesigned by Peter Thompson. It offers tennis, a restaurant, lounge, library and bar. Apart from being among the highest courses in the world (it claims to be the highest), the place features the country’s longest hole, a 610-yard par-5. The toughest hole is the 17th. Watch too for crows that occasionally swoop down to cart off a ball or two. Camp out in style at swish The Khyber Himalayan Resort & Spa (tel: [91-1954] 254-666, khyberhotels.com). And if you still hanker for that rarefied oxygen-deprived air, try the Shillong Golf Club (shillonggolfclub.golfgaga.com) in the eastern Himalayas, an 18-hole with 5,873 yards to play across. The magnificent views may hold up your play so factor it all in. And 11,500ft up in Leh, Ladakh, close to the Tibet border is the Army-run Fire and Fury golf course that will leave you literally breathless. This is a challenging, if awe-inspiring, desert course. Find a friend in green and get introduced. Several Indian metros boast fine golf clubs but you’ll need to be brought in by a member. Finally, Dubai may be in the Middle East rather than Asia proper, but the magnificent Emirates Golf Club (tel: [971-4] 380-1234, www.dubaigolf.com) deserves more than a mention. Its championship Majlis course was the first 18-hole grass course to open in the Middle East back in 1988 and is the location of the famous annual Dubai Desert Classic tournament. The closing hole is a signature hole: a shot across a lake to a green shaped like a bow tie. 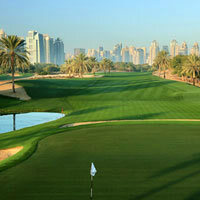 There’s also an 18-hole Wadi course that was redesigned by Nick Faldo in 2006 and is now known as the “Wadi by Faldo”. This is known as a “thinker’s course” since you have to “plot your way around it”. Also explore the Dubai Creek golf course and the 18-hole Greg Norman Almouj Golf in Oman under the same group’s umbrella. The Al Badia Golf Club at Dubai Festival City (tel:  4601-0101, www.albadiagolfclub.ae) was formerly part of the Four Seasons Group, now an InterContinental, with options to stay at the InterContinental Festival City or Crowne Plaza Festival City. Designed by Robert Trent Jones II, the par-72, 7,303 yard course offers golfers a “desert oasis” theme with ponds, lakes and waterfalls. Apart from enjoying a day out on the greens, golfers can sharpen their skills at the golf academy, a state-of-the-art facility that has two swing studios, a driving range, chipping area and putting green. It also boasts the region’s only TaylorMade Performance Lab. After a hi-tech analysis of putts, swings and drives, golfers can relax at the Club where there are lounge areas, steam and sauna rooms, and four dining options. In the Middle East also explore the Abu Dhabi Golf Club (www.adgolfclub.com) and, in Qatar, the fine Doha Golf Club (www.dohagolfclub.com). Finally, sequestered in the Aramco oil company preserve of Dahran in Saudi Arabia, is the Rolling Hills Golf Club (www.arabiangolf.com) with a busy roster of international tournaments. Well, if you’re going to splash out all that cash, you’re going to have to think long and hard. At least you’ll have about 7,000 yards of green for a good long walk if nothing else.